Today I noticed that Mr. Tanaka has added very high-quality scans to his Web site of Inspector Lee Gyu-won's 1882 Ulleungdo Inspection Report. Among the scans of the report, I have a question about one character in the section shown below. What is the first character within the red box in the scan? I ask because Mr. Tanaka seems to have left that character out of his transcription of the document. Mr. Tanaka simply wrote the following: 松竹于山等島. Is the character a mistake? Is the right half of the character circled to show that he made a mistake? Or could it be a slight variation of 松? What if Inspector Lee had wanted to write 松松竹于山等島, but wanted a way to separate the first 松 from 松竹? Is there a way of doing that without using periods or commons? If the character is not a mistake, I suspect Inspector Lee meant 松島, 松竹島, and 于山島 with his expression. 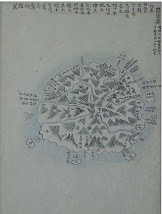 The Koreans translated 松竹于山等島 as 松島, 竹島, and 于山島, but we know Inspector Lee did not mean to write 竹島 because here he was listing the names of the islands he could not find. We know he found 竹島 because it was on his map, so here he meant to write 松竹島, not 松島 and 竹島. Remember that before Mr. Lee's inspection, King Kojong had said Songjukdo (松竹島) and Usando (于山島) were next to Ulleungdo. Inspector Lee responded by saying that Usando was just another name for Ulleungdo and that Songjukdo (松竹島) was a small island between 3 to 10 ri offshore of Ulleungdo. The King responded by saying “Both Usando and Songjukdo (敎曰 或稱芋山島 或稱松竹島) are written in the Yeojiseungram (輿地勝覽)," and that although the names 松島 and 竹島 are also used, there were three islands that made up Ulleungdo. You can read the full conversation HERE. 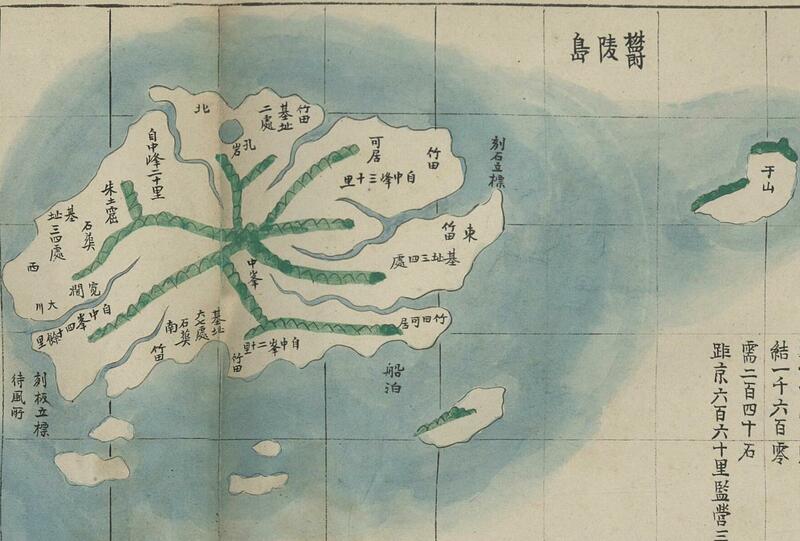 Therefore, during his inspection of Ulleungdo, Mr. Lee would have been looking for islands named 松島, 竹島, 松竹島, and 于山島. Lee found Jukdo (竹島), but he did not find the other three. The Koreans the Inspector found on Ulleungdo all said they had heard of a small island named "Songjukdo" (松竹島) and/or "Usando" (于山島), but they did not know where it was, and Inspector Lee said he could not see any other neighboring islands in the area. So, again my question is, "What is the first character in the red box below?" So, 李奎遠Lee Gyu-won concluded 于山 is old name of 鬱陵, just like 耽羅 is old name of 済州. Same as 慎鏞廈. Maybe 慎鏞廈 quoted 李瑄根. 「称」the first looks「オ」+「尓」in handwritten manuscript by 李奎遠. 「称」the second, in the sentence "則于山之称鬱陵" looks 「禾」+「ム」+「小」. The third「称」in the last sentence "如耽羅之稱濟州是白如乎" looks almost 「稱」. Thank you, guys. 称 makes sense. 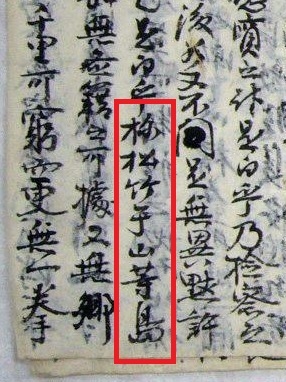 when he transcribed 江原道觀察使 鄭泰好 謄報. But 各 looks more like 各 than it looks like 啚, especially in a typeset article. 地形 (지형) means "topography" or "geographical features," so 各地形 means "various geographical features" or "each geographical feature." 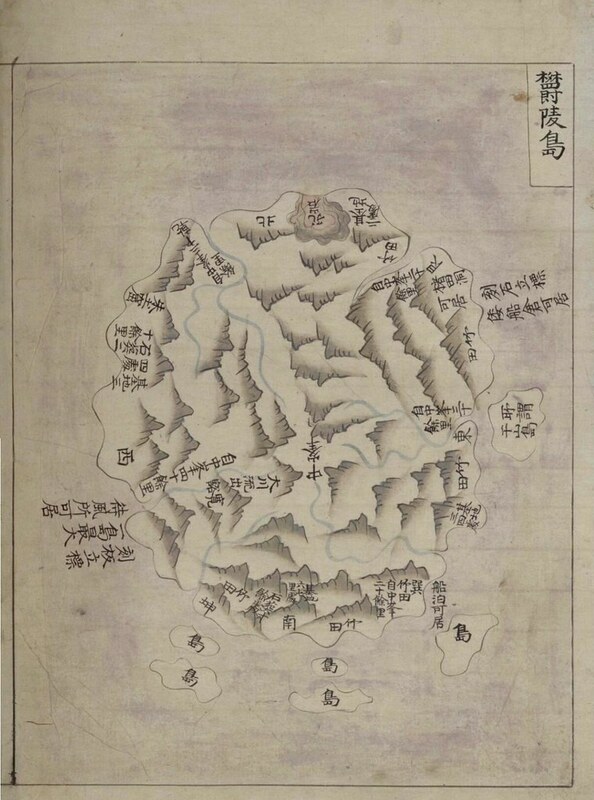 Since the name "Ulleungdo" (鬱陵島) preceded 各地形, the character 地 (land) became redundant since we already know Ulleungdo is "land," and, therefore, the characters 地 was dropped, leaving simply 鬱陵島各形. I do not remember seeing the first half of Inspector Lee's 1882 report, thought I probably have. Anyway, I forgot we have never translated this document. What I noticed today that is interesting that even Inspector Lee said the two small islands were "in the sea on the southern side" (南便洋中有二小島). 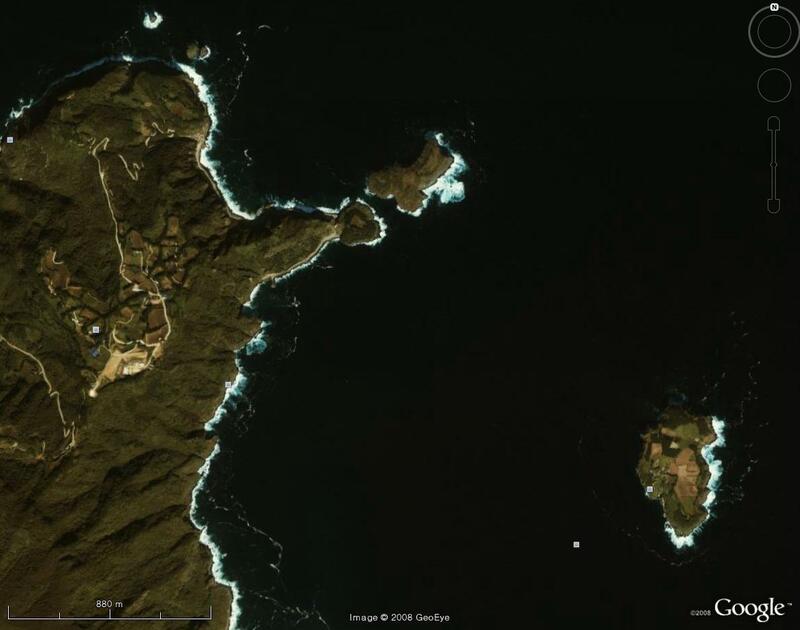 Customs official F. H. Morsel also described Ulleungdo neighboring island of "Wosan" (Usan) as an islet on the "south east," about a quarter of a mile from the main island. What is it about the shape of Ulleungdo that make people think Jukdo is on the south side of the island? 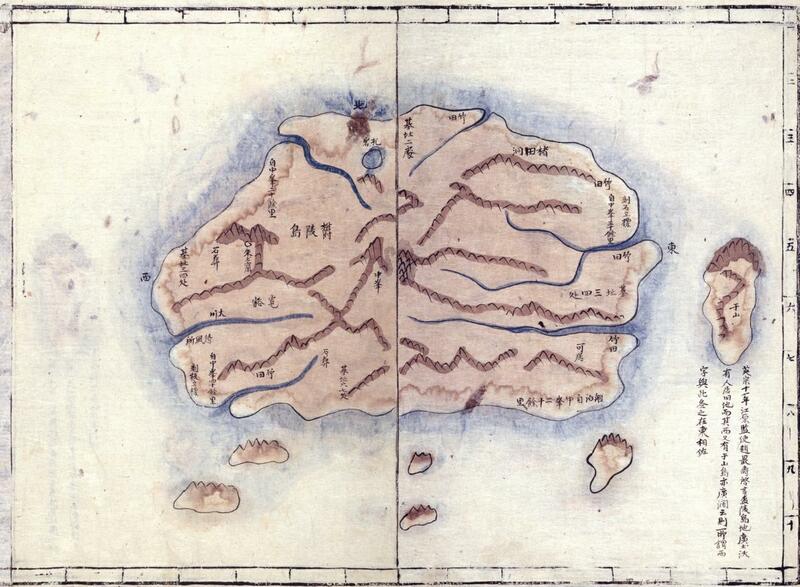 Also, the description of the two islands seems to be describing only one island, giving only one length and width and only one circumference. Also, it is not clear if "Dohang" (島項) and "Jukdo" (竹島) are two different names for the same island since only one island has been described, though the map makes it clear which is which. 人云　島項　亦云竹島也 literally translates as "people (人) call it (云) Dohang (島項), and (亦) [they] call it (云) Jukdo (竹島也)." I take it back. 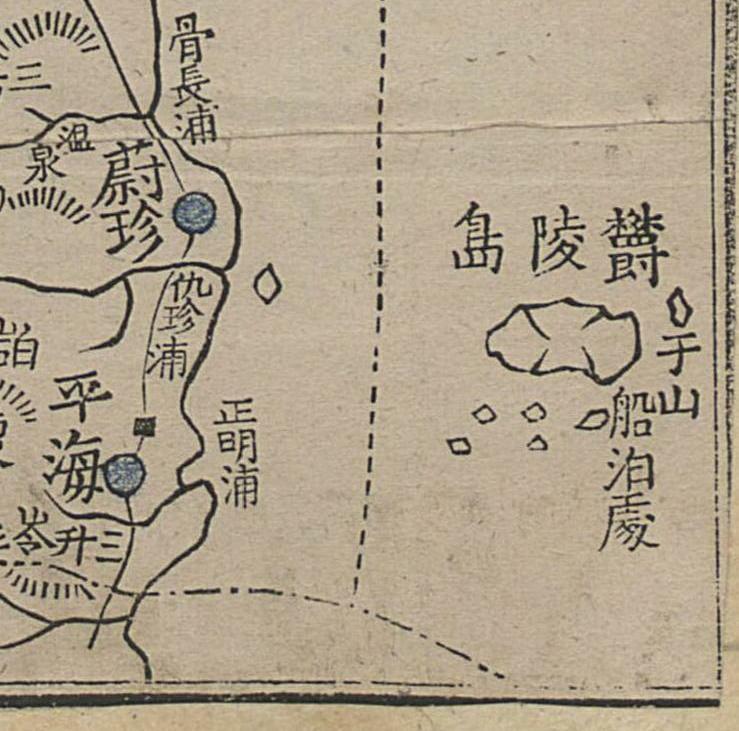 Inspector Lee's 1882 map does not really make it clear where "Dohang" (島項 - 도항) was since two islands seem to have been labeled as 島項 on the 1882 map. "Japan, however, never dismiss the fishing profit aound the island 'Ulneungdo,' but planned to occupy a corner of it by some means and became to find out a small island called 'Docksum' in Korean name, meaning "a small pot-shaped island, near the Ulneungdo, where whales gathered." As you can see, the men of the Patriotic Old Men's Association thought "Docksum" (독도) meant "Jar Island," not "Lonely Island." They also thought it was at a "corner" of Ulleungdo, apparently not realizing that the "Jukdo" (竹島) the Japanese was claiming was 92 kilometers away from Ulleungdo, not the "Jukdo" (竹島) just two kilometers off the northeast "corner" of Ulleungdo. 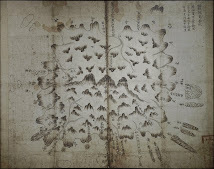 Therefore, the name "Dohang" (도항) may be the origin of the name "Dokdo" (독도). "Also, there were three islands in front. 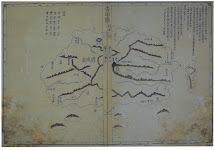 The one to the north was called 'Bangpaedo' (防牌島), the one in the middle 'Jukdo,' and the one to the east 'Ongdo' (翁島). 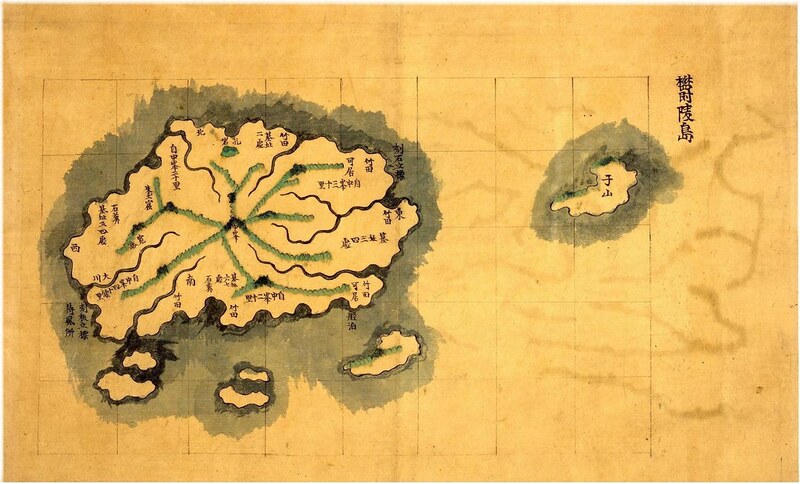 The distance between the islands was only about 100 paces, and the circumference of each was tens of pa (把). It was difficult to climb up and look because the rocks were steep and very towering. We slept there." People say; One is called 島項, another is called 竹島. It is just fit we call them. >"Ongdo" (翁島), which could also be translated as "Dokdo," meaning "Jar Island. " ＞"Also, there were three islands in front. The one to the north was called 'Bangpaedo' (防牌島), the one in the middle 'Jukdo,' and the one to the east 'Ongdo' (翁島). 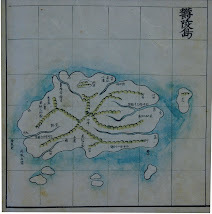 'Ongdo' (翁島)　could be called as "Dokdo," meaning "Jar Island. " "Dokdo," can be written as 石島. 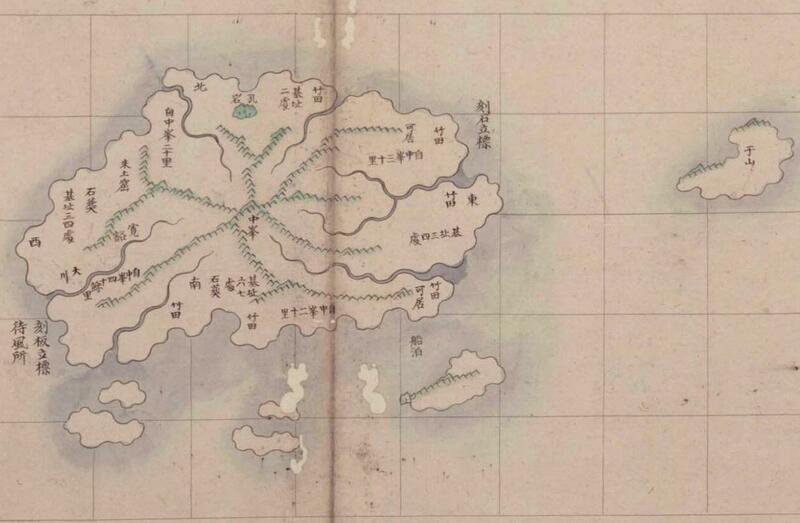 Judging from Inspector Lee's 1882 map, I had always assumed that 石間朱穴 and 船板邱尾 was to the south of Gwaneumdo (觀音島), which means 島項 would have been referred to as an island to the north of those places, not the south. As for the description of the two islands, yes, it did say each (各) had young bamboo growing on one side and grass growing on the other, but when the height, width, and length were given, 各 was not used. Then when describing "Wang-Dal-Ung-Tong Cove" (臥達雄通邱尾), it was described as being "a harbor inside it" (其内浦). The cove could only be "inside" (内) one island, not both, so the description seemed to switch from describing two islands to describing just one. I got the feeling that 臥達雄通邱尾 might be the cave I had read about somewhere that was on the backside of 觀音島 (관음도), the place I remember being described as where pirates used to hide. Also, I think the name 通邱尾 is significant because it literally means "a passing through cove," suggesting that there is a narrow entrance. I have also wondered if 臥達雄通邱尾 could have been the name of the narrow gap between 觀音島 (관음도) and the shore on the main island, based on the description of how difficult it was to pass through. It has been a long time since I have read all of this stuff, so my memory is a hazy, but the description of 臥達雄通邱尾 being "inside it" has piqued my interest. I might translate this portion of the report so that I can study it more closely. "On the south east is an islet, called "Wo-san, about 500 feet high, a quarter of a mile from the main island with a deep passage between the two. Unless examined closely, a landing seems impossible, but between Wo-san and the point projecting from the main land, there is a small beach and here close to the shore a vessel can find anchorage in from 16 to 25 fathoms, but even this harbor is available only in fine weather." As for "Ongdo" (翁島 - 옹도), that was a mistake I just notice. It should be 瓮島 (옹도), which translates as "Jar Island." The Korean definition of 瓮 is "독" (jar), which you can see HERE. Therefore, "Ongdo" (瓮島) could be translated as "Dokdo" (독도). I do not understand why you think 瓮島 is the origin of 石島 (석도). 瓮 means "jar," not "stone." By the way, 瓮 also means "물 장군," which means "water pot." And 오줌 장군 is a chamber pot, which is a pot kept in the bedroom so you do not have to go out at night to use the restroom, so 장군 (jang-gun) means "pot." 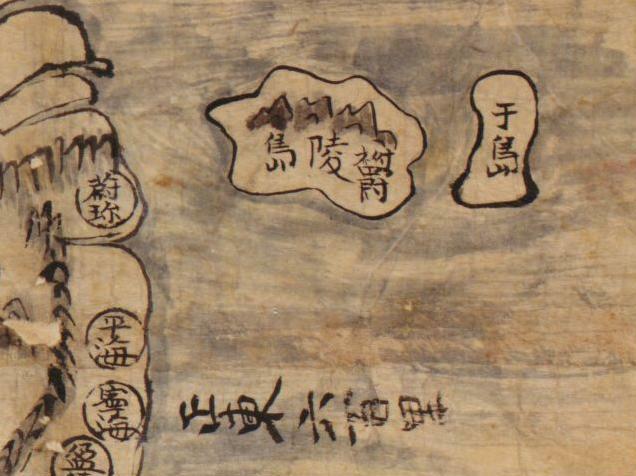 On Lee Gyu-won's 1882 map there is a rock labeled 將軍巖 (장군암), "General Rock." Since pure Korean words have no Chinese characters, Inspector Lee used the Chinese characters 將軍 (장군) to represent the sound of the pure Korean word for "pot." 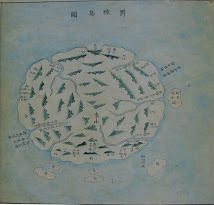 Therefore, the 瓮島 (옹도) mentioned in the 1794 inspection report and the 將軍巖 (장군암) on the 1882 map are the same rock, which means the 將軍巖 on Lee's 1882 map is "Dokdo," which means "Jar Island" or "Pot Island." 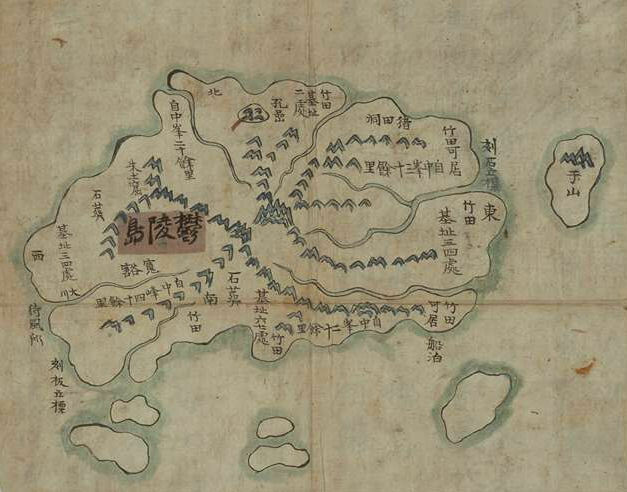 The link below shows the caves on the far side of Gwaneumdo (觀音島). I think the larger of these two caves may have been the 臥達雄通邱尾 mentioned in Lee Gyu-won's 1882 report. >I do not understand why you think 瓮島 is the origin of 石島 (석도). 瓮 means "jar," not "stone." I followed Korean way of thinking. 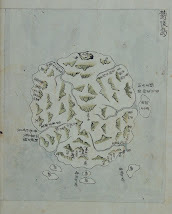 "Ongdo" (瓮島) could be translated as "Dokdo" (독도). Besides that, 崔南善pointed out there is another 독섬 at the east coast of Ulleungdo. We have to revise Tanaka-san’s text. If you are seeing this blog, please come back! I am always checking your site. 李奎遠　met the king BEFORE his trip. 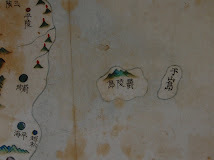 Both the king 高宗and 李奎遠　did not mention about 于山島　or 松竹島 after he returned back from 鬱陵島. 高宗said he had read all the reports and maps. When 李奎遠 met those Japanese? 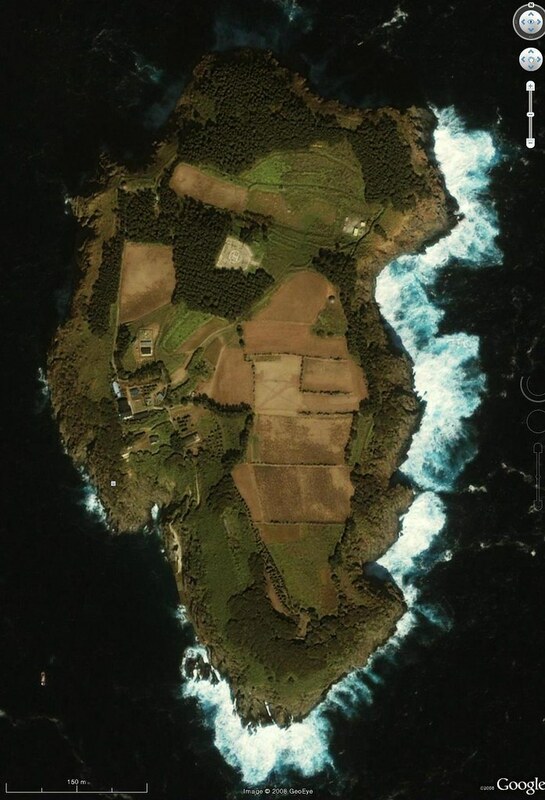 I think 石間朱穴 and 船板邱尾 are both on the shore north side of Gwaneumdo, just to the east of the Two Brothers Rocks. In the video link below, look at the RED rock or dirt layer in the side of the cliff at 4 minutes 7 seconds (4:07) into the video. They have carved out a road there, but the red rock suggests to me that spot may have once been the location of the Seokganju Cave (石間朱穴) on Inspector Lee's 1882 map. 船板邱尾 would have been on around the corner toward the east, at the entrance of a valley since Inspector Lee's report said there was a valley behind the cove. 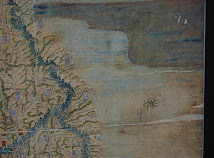 Inspector Lee's map shows 臥達雄通邱尾 between 石間朱穴 and 船板邱尾, but we know that modern-day maps show 臥達里 on the shore south of Gwaneumdo, so Inspector Lee's 臥達雄臥達雄通邱尾 is out of place. 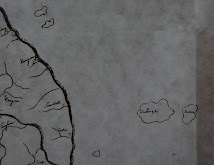 Also, his map shows rocks where a cove should be, and his report said the cove was "inside" the island. Therefore, I think it is possible that Inspector Lee's 臥達雄通邱尾 was the small landing on the west side of Jukdo. Inspector Lee talked about how dangerous entering that cove was because the current was so strong, even on days without wind and waves. That is similar to what F. H. Morsel said about the "harbor" on Usando (Jukdo), which he said was just a quarter of a mile off the shore of Ulleungdo. Morsel wrote that the "harbor" on Jukdo was "available only in fine weather." 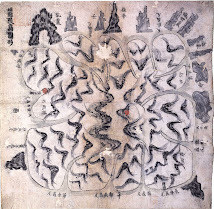 However, I guess it is also possible that 臥達雄通邱尾 was the "Dragon Cave" (龍窟) on the shore of 臥達里. As I suggested before, I don't think 通邱尾 is the name of a cove, but might be a kind of cove, one you pass into, possibly a cove inside a cave or between rocks. Another thing I want to brainstorm about is the name 臥達里 (와달리). In Jejudo, I think, 와달 means "crazy," so 臥達里 could mean "Village of Crazy People." And since 雄 (웅) can mean "leader" or "boss (두목), 臥達雄通邱尾 could mean "Cove of the Crazy [Bandit] Boss." HERE is a short Korean animation about a legend supposedly associated with the Wadal Village ( 臥達里) "Dragon Cave." The link to the YouTube video showing the RED rock is HERE. Remember to check for the RED rock or dirt starting 4:07 in the video. I am almost finished translating the 9th day of Inspector Lee's trip around the island. I think it is important and interesting, so I have been trying to be very careful with my translation. However, I am still not sure if they are giving the measurements of one island or two. The following link has some pretty good photos of the abandoned Wadal Village and Dragon Cave. I guess it could have been a so-called "cove," but it seems to offer little protection. Maybe my theory about Wadal Cove is wrong? Dragon Cave, by the way, is huge. It makes me want to fly to Korea and visit Ulleungdo. It took a little while for the page to load on my computer. 晴朗西風　二十九日　(甲申晴西風)　巳時量　三隻船　同爲發船而　啓本與謄報并　成貼出付及到四十里中洋海上風微殘水逆? 逗遛洋中夕陽東風少々起　終夜行船正夜半雲? 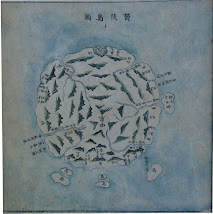 Where was “Wadal Ungtong Cove” (臥達雄通邱尾) in 1882?